Heat oven to 350 degrees. Line 12 muffin cups with muffin liners or spray with non-stick cooking spray. In a large bowl combine flour, sugar, baking soda, and salt; set aside. In a medium bowl mix mashed bananas, yogurt, eggs, butter, and vanilla. Lightly fold banana mixture into dry ingredients with rubber spatula until just combined and batter looks thick and chunky. Fold in hazelnuts. Divide batter equally among prepared muffin cups. 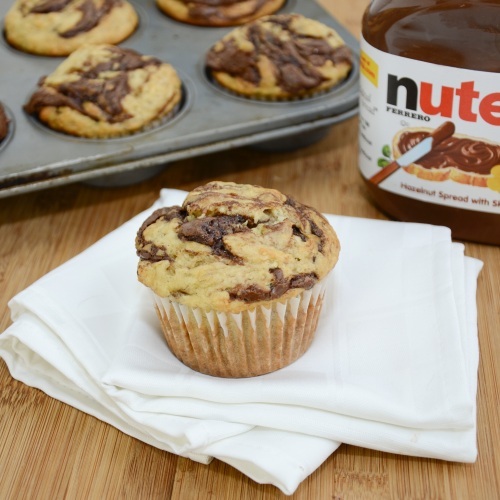 Place 1 teaspoon of Nutella on top of each muffin. Swirl with a toothpick. Bake until golden and toothpick inserted into center of muffin comes out clean, 20 to 24 minutes. Remove muffins from tin and serve. NOTES: Baking soda is naturally gluten-free. Nutella is gluten-free! Yogurt is naturally gluten-free, but because of additives, please check the label. PLEASE CHECK your vanilla, not all extract is gluten-free – McCormicks is good, I use Madagascar Bourbon Vanilla Extract which is gluten-free but a little pricey. I really like Pamela’s Baking mix for all of my sweet baking and have found that I can use it as a cup for cup exchange in all of my old tried and true recipes. Also check your non-stick cooking spray – not all are gluten-free! 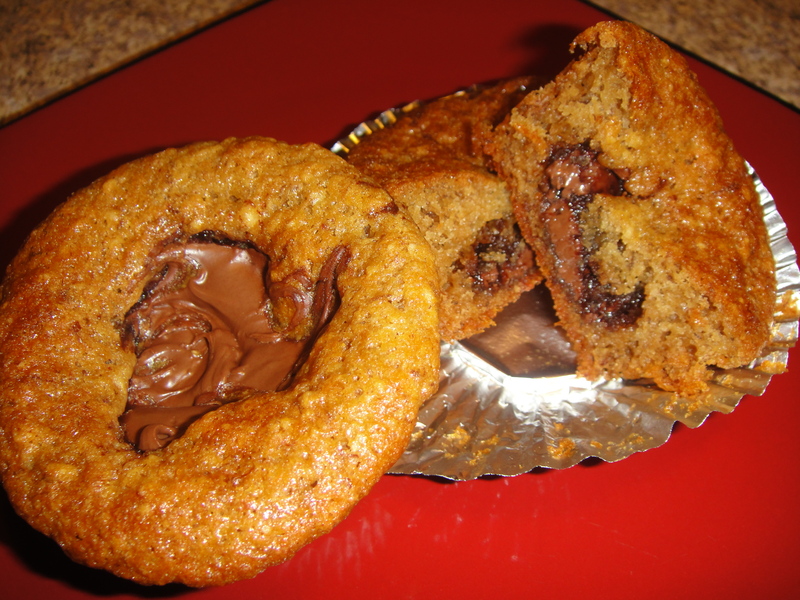 In this gluten-free version……..I did not swirl in the nutella. The muffin has a banana bread texture…a bit heavier but very moist. I use very dark bananas so the batter is darker than usual. This muffin was excellent and I will be making this again! A big shout out to Diane Krejci Sullivan who found this recipe at Sweet Pea’s Kitchen (http://sweetpeaskitchen.com/). I modified it to make it gluten-free. Thank you Christina for an amazing recipe. Next Post What the Heck is Gluten and WHERE do I find it? Nutella is the best thing ever invented.